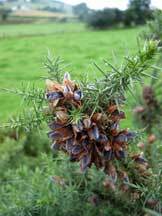 During July and August, pick the pods carefully from the bushes. Watch out for the sharp spines. Place the pods in a biscuit tin or other similar container. Alternatively, if you have a large number, put them in a bread basket that is lined with plastic. Whatever you use, it musn’t allow the seed to fall through. 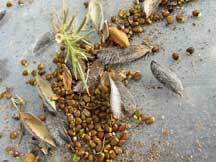 Place the container somewhere warm (in a greenhouse or airing cupboard) and leave the seeds to dry. This may take a few weeks. The pods will ‘explode’ releasing the seed inside, so make sure there is a cover on the container! The extracted seed is treated differently from most other seeds. The very hard seedcoat needs to be damaged in some way to allow air and moisture to the embryo plant inside. This is most simply done with boiling water. In spring, place your seeds in a heatproof container and pour three or four times their volume of boiling water over them. Leave to cool in a safe place for 24 hours. They are now ready to sow. 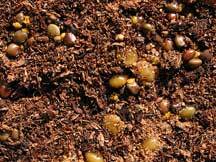 Drain the pre-treated seeds and sow them thinly in seed trays filled with peat-free compost. 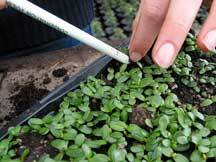 Cover them with another 5mm of compost and water thoroughly. Cover the seedtrays with a sheet of glass and shade with newspaper. Place them somewhere bright and warm – a kitchen windowsill or greenhouse, perhaps. Keep the trays moist at all times. You shouldn’t need to water much if you have the sheet of glass in place to prevent evaporation. Remove the glass once the seeds have germinated. When the seedlings are beginning to develop their true leaves, transplant them into individual pots or into other trays. Leave 10cm between plants. Keep them watered and fed and they will grow quickly. The plants should be ready after one year for planting out. Prepare the site well by clearing away any weeds or grass and make a hole big enough to accommodate the root ball. Plant carefully in the hole, to the same depth as it was in the pot, and firm back the soil.